Home / celeb / dato seri vida / dsv / malaymail / music / news / videos / viral / Dato Seri Vida is so glamorous in her new music video! 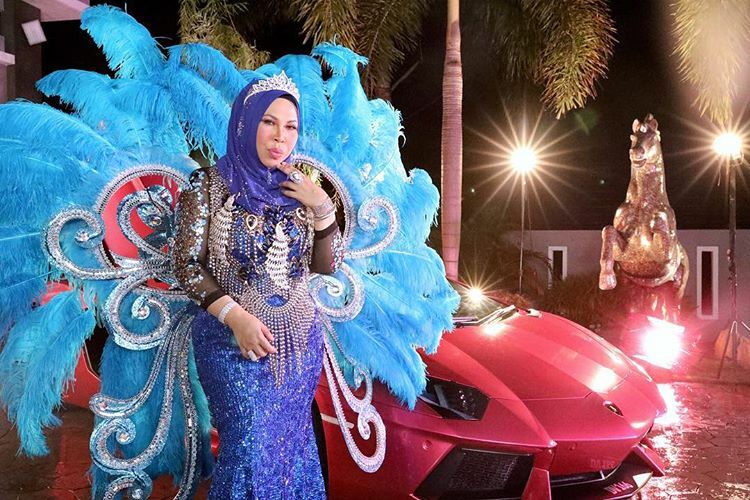 Dato Seri Vida is so glamorous in her new music video! At long last, sensational Malaysian celebrity Dato Seri Vida (DSV) finally unveiled her much-anticipated official music video of her viral hit “I Am Me”. The music video which was released yesterday, features a lot of glitter and gold, which really suits the lavishly flamboyant diva image of Dato Vida, as expected. Shot at her own bungalow in Ipoh, Perak, the music video sees DSV donning all sorts of glamorous and sparkly ensembles with various jewelry, furs and ornaments! She can also be seen fanning herself with several RM100 bills in the infamous bath tub scene. Wow, she is livin’ la vida loca indeed! Directed by Malaysian director Ghaz Abu Bakar ("Polis Evo"), the total cost for the music video is reportedly RM1 million. In the video, DSV whose real name is Hasmizah Othman, also promotes her perfume Diva, while also showing off her handbag collection as well as her pink Lamborghini. Her daughter and son, Cik B and Kacak were also featured in the video, alongside a few other kids.